Your abdominal cavity contains a number of essential organs and tissues, including your stomach, intestines, kidneys, liver, spleen, pancreas and large blood vessels such as your aorta. Pain in your abdomen, which can range from persistent dull aches to stabbing pains, can indicate a huge range of underlying disorders, including some nutritional deficiencies. Potassium aids in a number of biological processes: it represents one mineral involved in nerve communication, plays a role in muscle contraction and helps maintain the function of several enzymes. Potassium deficiency can affect the nerve tissue responsible for the movement of food through your digestive system, causing bloating, constipation and abdominal pain. Left untreated, severe potassium deficiency can also affect other vital organs, causing abnormal heart rhythms. In some cases, vitamin deficiencies can also lead to abdominal pain, and failure to consume enough niacin can affect your abdomen. One of the primary functions of niacin is to help your body break down nutrients to access the energy needed for cellular functioning, so niacin deficiencies can affect a range of cells and tissues. The deficiency causes stomach distress and abdominal pain, and can also lead to depression, skin rashes and hair thinning. Another possible cause of abdominal and stomach pain is a deficiency in vitamin B-12, or cobalamin. Vitamin B-12 is essential to proper red blood cell functioning, because the vitamin helps produce hemoglobin -- the compound your red blood cells require to carry oxygen. Vitamin B-12 deficiency leads to a condition called pernicious anemia, which occurs when your blood cannot effectively carry oxygen to your tissues. 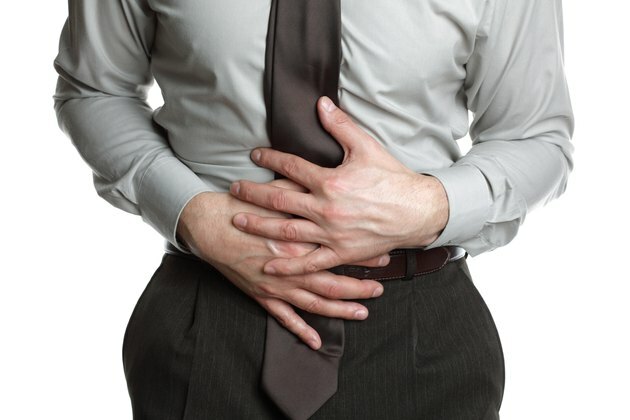 Individuals suffering from pernicious anemia can develop an abdominal gas buildup that can be painful. In addition, vitamin B-12 deficiency can cause stomach upset, enlargement of the liver, as well as stomach upset. While several vitamin deficiencies can cause abdominal pain, nutrient deficiencies do not represent the range of conditions that can cause pain in your abdomen. Abdominal pain is a very general symptom, that can indicate the presence of a huge range of disorders from lactose intolerance to kidney stones, or even diseases such as colon cancer. If you experience severe or very frequent abdominal pain, seek immediate medical attention to determine the underlying cause, and help to prevent further discomfort and distress. National Heart Lung and Blood Institute: What Are the Signs and Symptoms of Pernicious Anemia?